Aluna Joy and the Star Elders. The following is the first of 3 messages that we received in the Yucatan this past December. You can find our other messages on our website at www.alunajoy.com under the "Articles for Personal and Planetary Transformation" link. It might be a good idea to read them in order as each message builds upon the previous one. We are sharing this message here with you just as we received it, in present time, with very little editing. We do this for a very important reason. We know the messages that we receive are not just for our groups, but are for others as well. The Star Elders assure me that the message and the corresponding energy will be transmitted to you. So as you read this, you might want to imagine that you are with us. Also, always view the photos on the website that we share, as photos also hold some energy of the sites. December 08, 2011 - Aluna speaking at our Opening Circle at our hotel. Our Mayan guide, Enrique, shared that he felt that, during this pilgrimage, we will be working to heal the past and remove old obstacles. I know that this trip will unfold to reveal this more. When I chose our hotel, I had no idea that it was named and in honor of Bishop de Landa. This Bishop, in the past, had burnt nearly all the Maya codices. At first I was not happy about being in this hotel. Then I walked into the next room and saw a huge statue of Archangel Michael and St. Francis, who are two of my buddies. I have never been a fan of Bishop de Landa, because of what he did. Enrique shared another side of the story. He shared that Bishop de Landa was forced to do something that he didn't want to do. The Queen of Spain demanded the he burn the books. In later years, we hear that Bishop de Landa went a bit crazy out of grief. 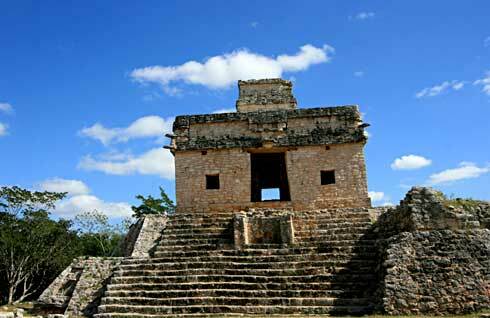 He tried to recapture the Maya wisdom in the books that we now know as the Popul Vul and the Chilam Balam. These two books are not complete Maya tradition. They were written after the conquest with the help of Bishop de Landa and a Spanish speaking Maya scribe. I think it is interesting that at this time we are here at this hotel and this part of the Yucatan, as Maya supporters. It is a time on Earth when it is time to forgive and heal our past wounds. It is time that we move beyond our history. So, we are staying in a hotel which is named after a man who is known for destroying the Maya codices and help cause the fall of the Maya World. It is time to heal this old wound. We have been noticing in the last few weeks, how little dramas have been trying to sneak back into our lives, and how we have had to work on forgiveness more and more by forgiving everything. It feels like that might be a very important part of our 11 Chuen group energy (our group's collective energy); about letting go and forgiving everything. That includes forgiving ourselves, our family and friends, our country, our elected and global officials and the entire past world history. We are coming to a point where we cannot hold onto these wounds any more. It is a time when we can come together as ONE, actually bring all the dimensions back in alignment, and have them all ascend to a higher frequency. Group member Linda shares: The course of miracles says that we need to forgive everyone for what they never did to us in the first place, because no one can do anything to us. By putting your body against this stone, we exchange a little bit of energy . . . we call this, doing a Zuvuya. This is where we go into the rock a little bit, and the spirit that is inside of the rock comes to you a little bit. It builds a communication bridge. The Star Elders told by many years ago that this was as a doorway to the future. But at the time, it was too soon to open it, or go through it. Still today, that is true to a certain extent, but we are closer to it being time. We are close enough that what the Star Elders are doing for us is going to help us have a door inside of ourselves to the future right now. It doesn't have to do with this stela. This door to the future has to do with what we have inside of ourselves (and for YOU that are reading this now). So, the Star Elders are going to activate this memory inside of you. You will remember how to move through time and space without getting lost. When we were in Dzibilchaltun this morning, the Star Elders said that they were going to blast open the Sun in our hearts, and when we went into the Temple of the dolls (at Dzibilchaltun), you all had time to stand in the center of this Sun temple. This is where this process started. The Sun in your heart is blasting open like a quasar in the universe. A quasar totally explodes and it sends out radial, ripples or waves of LIGHT. We need that kind of blast inside of us to open the doors to the future, or doors to this new higher frequency. This is a simultaneous blast that comes from our collective hearts. So, today we begin the process of letting our hearts explode with solar energy. Our hearts are blasting open, and the stone is giving us a tool to make this happen. It is a tool to navigate the stars. The Star Elders know how to navigate the stars without any orientation point, because their orientation point comes from within themselves. The Star Elders have been asking me to share about the orientation point inside of all of us (past messages posted on our website www.alunajoy.com) and how important it is to have this orientation point. Soon all of our old predictable orientation points are going to disappear . . . maybe even the Sun rising and setting, which is a huge orientation point for us. We take the sun for granted, but what if the Sun quit rising and setting. Imagine what that would do to our psyche. These tools, that the Star Elders are giving us, are going to help us remember how we will use our simultaneous blast of solar heart energy to open the doors to the future worlds. When I was here in 1998, they said this place was a door to the future, and I could feel the energy. But no matter how hard I tried, they wouldn't give me anything else, because they said it was too soon. We could mess it up if we had this gift to soon. Everything under the sun has a time when it will be released. So this site has definitely evolved from the last time I was here. So, now they are having me look at what they did with us this morning, and they are mixing that energy with this experience, and something will pop out that they will want me to share. They like to cook things. Well, there are two things appearing. First, the Star Elders say that the door to the future is already open and we are already partly on the other side. We are already part of the future, and this is why some of us have been feeling "discombobulated", and are having a hard time committing to anything, and being unable to focus. But we came here today to get another level of this discombobulated-ness. What they are showing me doesn't make a lot of sense in our time line, so I am just going to spit it out. Example . . . We work in habitual way to get something manifested, but this doorway works backwards to our routine ways of creating. It is very much like how we exchange energy with this stela. It is a cosmic, futuristic version of Zuvuya. To us, this may seem illogical and counterproductive by working in reverse, right? But in the Maya world, you always look at things backwards and when we are more advanced, from many different angles, as well as looking at things forward. This way we can get the full picture and not just a limited 3D linear version of the truth. This is shamanic visioning. Nothing was ever done in the Maya world for one reason or for one direction only. Everything had multi-dimensional reasons and purposes. We can feel ourselves heading toward something. And it is in a direction. And what they are giving us another direction or perspective on our vision. So when the two directions come together . . . when they collide. . . , it creates a matrix . . . a multidimensional perspective. It is a new orientation or a frequency. But this concept is losing some of its truth in this translation. So ask you guides to help you see this so it will be clearer. It is blending the dualities together to get the "spherical" truth of where the real and new orientation point is inside of us. We need to find the orientation point within ourselves. Example . . . imagine that you are off the planet, and you are a long away from any star or close object in space. When you can see this inside yourself, ask yourself the question "Which way would be north, south, east and west? Which way would be up and down?" Would we know the answer? At first, no, because there would be nothing in our physical world that would help us find the answer. When we go through a shift in an age, it can be very disorienting like this. When in this disorienting place, our survival instincts will take hold, and they will help us find an anchor point . . . a base camp." This place will be inside of us. It is already there. In our old world, if we are going somewhere, we always need a place of origin (where we came from) and a current location (where we are now). Then we can make a projection of where we want to go. This makes a straight line and is very 3D. This gives us a line of sight, or a path. But where we are going, there is no path, and there are no straight lines, because it is a spherical world. Our world will be spherical, our creating process will be spherical, and our time will also be spherical. The Mayas understood this, and this is why the Mayan calendar cycles are cycles within cycles . . . because they were trying to teach us how everything is created in a spherical place. We are moving into a spherical world. So today we are learning the way of the Zuvuya, and this is still very elementary: one direction, and the opposite direction. This is just two ways. The Star Elders say there are more layers to come where there are multitudes of directions. When this truth merges within us, we will have the truth of what is next. Right now, we still live in a world based in duality; thus we are still anchored in this reality. We are moving from a very limiting linear timeline to a spherical one. It is like cosmic multitasking in a very conscious manner. So . . . to recap . . . the Star Elders blasted open the sun in our hearts, and placed the knowledge of spherical creating into our heart centers where we are working to anchor our new orientation point in a new heart (past messages speak about the NEW HEART posted at www.alunajoy.com). We have an old heart center, but there is a new one being made in the new world. So this quasar that is exploding in our hearts is in the heart that we are creating in the new world. And that is why it is getting difficult to make decisions; because we are partly still here and partly there. This process is a way to activate the truth of spherical creating inside of ourselves, because most of the way we create in this world will be a lie or an illusion when we fully transfer ourselves to the next world. We are already noticing this shift in our lives already. Things aren't working the same way they used to. We got used to them working in the familiar, same way. Now the Star Elders want to take us to the next level , and this is about manifesting or creating spherically. In the near future, there will be a multitude of reasons for why you will do anything. Remember when they talked about the heart exploding like a quasar collectively, as ONE; not separately, but together? There is a reason why they showed me this. It is because the way we will manifest in the future has nothing to do with a singular "What I want in my life" kind of thing. It is going to be what is good for the collective. We will quit thinking about the individual self, and we will see ourselves connected to everything. We will consider what is the best option for the whole. This is the way we were actually supposed to be living on this Earth. We chose to take on this body, and committed to going through the dark cycles, so the Earth would not go into total darkness. This is why light workers are here on Earth at this time. We keep little threads of light tied to the great central sun. The trade-off for this honor and great act of service was that we also had to forget. This forgetfulness was a gift from the Great Creator so we could tolerate the density of this Earth during dark cycles or underworld cycles. We forgot our natural limitless and cosmic abundance. We forgot how to create spherically for a while, so the Earth could go through its incubation. This incubation is done. We are ready to remember. Our Maya Guide Enrique shares: I want to share with you a small revelation that I just had. I closed my eyes, and I saw the sun shine in my eyes. It was first yellow, then taking all the tones in the red color. They wanted to give you the answer that you are asking here. The door to the future is how the Mayas transcended to another level. They told us, "When we were here, a big fire came from the sun, extending its intensity everywhere. For the people that had already awakened, their spirits began to shift to this higher level, which we call future, which is not a dimension. It looks like a direction, but it is not a direction. We call it future, because we are referring to this to our present time. What was the future in that time, it was the present in this time." So they mentioned to you . . . Aluna, younger sister . . . they showed you how it was done in that time. The brilliant light came like a blast, and for the ones that were unprepared, it was chaos. But for the ones that were in harmony and peace, this was just the way to leap and change to a greater reality. So how we experience this blast depends on how we are in the moment when it comes. This was something that felt like a really, really deep experience. I didn't know they were going to appear here today. I only can tell you that I feel so blessed and humbled that the spirits gave me this answer, and that this light, this blast that came to us here, and that they are sharing this with us in this moment. It is humbling for me to share this. I cannot express the feeling, because it only could be done by this group meeting. It had to be all of us, as one. We are all. We are the sun. We are the earth. We are this living stone. Thank you. Aluna: I know that the universe picks our groups for a reason, and because we recognize this stone as a living guardian, it felt recognized, honored, accepted and acknowledged. You would think it wouldn't need acknowledging, but it does. Just like the trees need acknowledging, and the stars, and the pyramids, and the Earth. We all need acknowledgment, because we are part of a living creation. We need acknowledgment to be alive. The guardian in this living stone never went through the stars to clear itself after it had dropped its body. It went right into the stone with all the memory of being human. So when we find a living stone and acknowledge it, this makes its work easier; like when we are acknowledged with our work in this world. It makes it easier for us to keep going, because we are human beings, and we are social animals. We need the acknowledgement and community. Our spirits don't need any of this. But we are still in physical form, and it is advantageous to acknowledge that we need acknowledgement and community. As spirits, you don't need the acknowledgment, because we are all connected. We don't feel separation. But when we are a human being, we feel a little separate, and that is part of the journey that we decided to take at this time. It is important that we are here at this time. Otherwise the Earth could have died and turned into something like the moon. We kept the Earth alive by keeping the threads of light anchored while the Earth was going through an incubation cycle. That is what the living stones do as well. They keep the light anchored on the planet while the Earth is going through a time in cosmic underworlds and where life is really out of balance.